I know I've been gone a long time. I have had a really evil cough, followed by a really evil cold, on top the Christmas rushing around like a mad thing. I'm going to skip all the usual "Review of 2011" posts and smack head-long into the New Year with some new WIPs. I don't know about you, but as soon as all my Christmas crafting is completed I want reward myself with some fairly quick fix selfish projects. In that vein, I give you - the Winter Warmer! I know it looks weird, but it makes sense if you know it's designed by Cat Bordhi. The pattern on Ravelry is Warm All Winter. It's a balaclava/cowl type affair, and I knew as soon as I saw it, I wanted to make it. I have been struggling to find a way of keeping my head and neck warm on my Mobility Scooter for a couple of years, and all options seem to be flawed in some way. This looks like a winner to me. The pattern is constructed in similar way to the socks I made last year from her Personal Footprints for Insouciant Knitters book (<--this link takes you to a website that will post outside the US). If you are in the US, you can buy from Amazon. 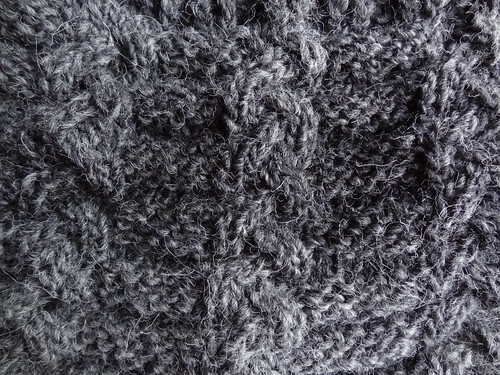 The main technique in this book, which is also used in this head wear, is to mark a couple of rows with waste yarn, with one row between, whilst knitting. Then when the main body of the item is complete, the waste yarn is replaced by a circular needle, which you can see in the first picture in this post. 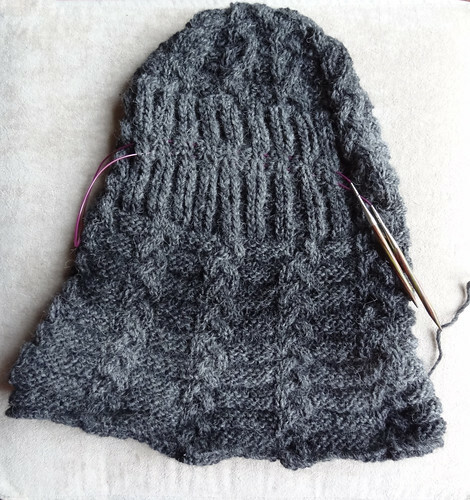 The row in between the rows on the needles is removed by cutting one stitch (not on the needle) and then the row is unravelled. It seems like magic to create an opening this way, but it does really work. In the sock pattern the leg is simply knit upwards from the newly live stitches on the needle. In the Warm All Winter pattern, you simply cast off to get a space for your face! I am using Sirdar Peru as my yarn, in the Tailor colourway. This yarn is hard to get hold of, as it is discontinued, but I really love it. I used it initially in my Blanket Blue Gilet and then used some left overs to knit my Sideways Grande Cloche. This hat has been my "go to" hat for when it is really cold, which is why I felt Peru would be a good choice for my latest head warming project. All I have left to do it make that one teeny tiny snip - I'll let you know how it goes on Friday! If you need something to while away hours until the big reveal, you can always look at what other people are up to, by clicking on the button shown below.